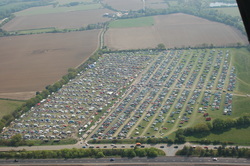 admin - Welcome to BOOT GROUP Colchester's "oldest recorded" original and Biggest Car Boot Sale! Thirty - one years of regular car boot sales began in Essex on Saturday 26th September 1987. One of the first sites was at James Blyth's farm in Ardleigh on the "Field at the Corner of Wick Lane and Old Ipswich Road"... now much more easily known as The Ardleigh Showground CO7 7QR. At first, Saturday was chosen as it didn't conflict with the sale on the Avenue of Remembrance then running on Sundays. The following year Sunday was chosen as this is the most popular booting day of the week and the choice was soon proved right. The enterprise grew very quickly. It became known as ‘The Late Risers Car Boot Sale’ because at that stage it was being run by Henry Shaer of H & G Promotions who was running the Sunday sale for early risers off the Avenue of Remembrance (Cymbeline Way). This soon proved to be unworkable as the Ardleigh gates had to be opened earlier and earlier as the queues to get in at Ardleigh got bigger and bigger! At the end of the third season the Avenue of Remembrance site closed and the Ardleigh site came into its own. Over the next few years various attractions came to Ardleigh. Who remembers Melpac, the meat sale/show in the big pink 40 tonne articulated lorry? There were also Pete’s fairground rides, mini quad bikes, pony rides and even on one occasion a privately owned fire engine giving rides with sirens blaring. (We had to stop this - just a bit too loud!). Other non-car boot attractions have been the visits of Chipperfield’s and Roberts Brothers’ Circuses and of course in the year of the millennium the field got its new name The Ardleigh Showground when James allowed the village to use the field for the Ardleigh Millennium Spectacular. There has also been regular use of the field on weekdays over the years by the Essex Police who use it for training their police dogs. Other uses lately have been quite spectacular land yacht training, pigeon racing, beach casting, microlight flying…all of whom were welcome as prior permission was obtained. In the Autumn of 2006 Scott May's Amazing Stunt Show came and wowed the crowds one evening...and again in March 2008...no doubt he will be back! On the Last Sunday of 2011 a short video was published about Booting filmed at Ardleigh.... Click here to view it. Of course, every winter the site is closed and Mr Ketley’s prize winning sheep can be seen grazing - if you look closely early in the spring you might even see some lambs about! Meanwhile, in 1993, Bob Harrington began a modest car boot sale on Saturdays in the town at Lexden Nurseries, off Remembrance Avenue. Initially, it was to promote the sales of plants and flowers at the nursery, but after a short while the boot sale became an earner on its own and attracted 70 or 80 pitches each week. Many of our Saturday regulars today began attending at this time. Who could forget Chirpy, who collected the money with his cockatiel on his shoulder!! Norman and his family were the caterers with their ‘East Side Diner’ - they've hardly missed a boot sale since! The first Weeley car boot took place in October 1994, on a Sunday! Only 7 booters turned up - and they were only discovered when the pea-soup fog suddenly lifted. It was a bit daft really, organising a boot sale near the end of the season with big Sunday competition elsewhere, but Chris and Jayne Harrington were skint and needed the money. Come November they were even skinter!! Fortunately, once bitten didn't mean twice shy and when his father sold Lexden Nurseries in the summer of '96, Chris and Jayne decided to try Weeley again, this time on a Saturday, with many of the regulars agreeing to support the switch. It worked, and Weeley has steadily grown to the thousands who attend today. Many will remember Big Frank who collected on the gate. He suffered a long illness and we do miss him since he passed away in 2002. Of course, everyone now knows Lisa. She has been on the gate since 1997, and is the glamorous smiling face of the Boot Group. Whenever she goes to town, in Clacton or Colchester, she is recognised and given a friendly greeting. Trouble was, though we were granted planning permission, we were restricted in how many sales we could do. We needed another site to begin and end the year, preferably with hard standing. Lo and behold, follow the crow for half a mile and you come to the concrete strips of Boxted Airfield in Langham. Ideal. Part of Williamson's Fruit Farms – a beautiful orchard when we started there in 1997. Cheeky sellers would often have bags of fresh apples for sale! Sadly, we now only eat French apples (I don't - webmaster) so the trees are gone, but we’ve taken advantage of the extra space by sowing more grass. There’s now room for up to 300 pitches when the field is dry enough. Sadly with the sale of this site to John Rix, a farmer from Horkesley, this site is no longer available to us since August Bank Holiday 2006, as car boot sales "don't fit in with his style of farming!" The Marks Tey sale began as a direct result of popular demand. For some years, many of the booters had been encouraging Chris to find a mid-week site. Then Chris bumped into an old mate, Iain, who he played rugby with in the Colchester 1st xv in the early 80's. It turned out that Iain owned that superbly positioned field at Marks Tey. The barley was harvested, grass was sown and in the summer of 2001 about 50 sellers (and Norman's burger van!) started to trade on a Wednesday. Look at it now! Who would have believed we'd see such a fantastic boot sale in the middle of the week? There have been a few ups and downs. One Sunday morning we arrived at Ardleigh to find the toilets had been nicked. The police had nothing to go on! As the fame of our boot sales has spread we’ve been on the radio and on 10 TV shows! The Boot Group’s car boot sales are now the most popular of all the forms of leisure in the Colchester area. The attendance can easily be double that of Colchester United or even Colchester Zoo! Punters are attracted from as far afield as Kent, Norfolk and the Midlands. In early 2012 Chris and James parted company and Rosie and Robert, James' son and daughter took on the running of the sale.... so it is now in it's second generation! In 2014 Elton John's fans came and used the site for a car park for his concert at Colchester United's Stadium! and in 2017 the fans were supporting Ollie Murs!! With everybody’s support, long may they continue! Keep coming back! !